The Hawai’i Department of Land and Natural Resources (DLNR) is the State agency with primary responsibility for coordination and support of the IUCN World Conservation Congress Hawai’i 2016. This page is intended to serve as a resource for you and for visiting and local journalists interested in covering the huge range of conservation and environmental issues and challenge’s our island state faces. Visit the DLNR & YOU page daily before and during the World Conservation Congress for news releases, video features, photo galleries and more. Prior to the start of the Congress (August 22-31) and during the Congress, from Sept. 1-10 the DLNR will host daily news conferences highlighting some of the most critical subjects our state is facing. 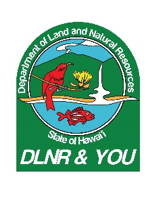 DLNR & YOU is our brand that captures the intent of “we can’t do it alone” and reflective of “Hawai’i at a Crossroads.” DLNR invites visiting and local journalists and every citizen and visitor to this special place to become engaged in respecting and caring for Hawai’i’s unique natural, cultural, and historical features.